I Would Set Myself on Fire for You - Believes in Patterns. 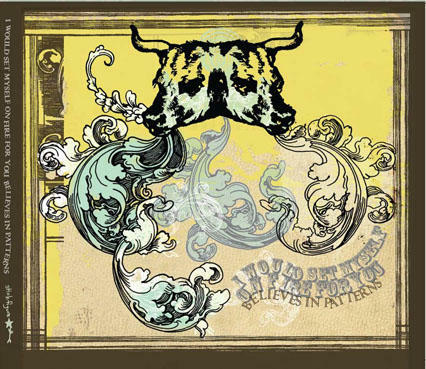 "Believes in Patterns", second album by I Would Set Myself on Fire for You, celebrates it's 10-year anniversary in 2016. On this special occasion band members told me about background of this record. I Would Set Myself on Fire for You was: Stephen - guitar, Lindsay - viola, cello, Tyler - keyboards, Justin - bass, Paul - drums, Danny - guitar (on first album). Almost everybody sang. Stephen: I’ve always been a fan of underdogs, in music, in sports, and in life. If someone is willing to lose money to make a record or tour, I’m willing to listen to it, regardless of the genre. I worked as the music director of my college radio station and that was my favorite part of the job—hearing interesting music from creative, passionate people. I liked thinking about new ways to put those elements together in our own music. I would make these mix tapes or CDs of wildly different sounds and write notes like, “I want to do something like this part here, but in a screamy way that makes sense with our band.” Sometimes the notes were about guitar or drum or vocal parts. But just as often, they were about recording techniques, or composition, or soundscapes. I had recorded it on VHS from a history of rock and roll show. I was blown away by their showmanship. When I saw that video, I said, “THAT is what I want to do!” I would watch it over and over for hours every afternoon. It had a huge impact on me. I was always drawn to the idea of blending symphonic sounds with screamo. For me, that was the foundation on which my contributions to I Would Set Myself On Fire For You were built a year later. I had written most of Song One and Song Three before I met Paul, Danny, Justin, and Lindsay. Songs two, four, five, and six were written as a full band, including Danny. Those songs all sort of fit together in a logical way. They are heavier. Sort of chunky. Danny deserves a lot of credit for encouraging us to play with alternate tunings. In that way, he played a big role in shaping our sound during that period. When Danny left the band after the first record, it forced us to change the way we played. Everyone picked up the slack. Justin wrote more complex bass lines. Paul added more texture. I tried to fill the void in interesting ways with effects pedals, with varying degrees of success. We looked for inspiration in contemporary musicians like Joan of Arc or Mars Volta, but also older material. Ennio Morricone was a big one. We’d listen to “The Good, the Bad, and the Ugly” soundtrack for hours. Paul turned everyone onto Charles Mingus’s “Cumbia Jazz Infusion.” I started studying classical and Latin guitar compositions to think about different moods or rhythms that we could use. Adding Tyler on keys allowed us to explore new sounds, too: those nasty, spacey sounds of 60s/70s prog rock. Tyler: I joined the band as this record was coming together - most of the songs were already written and I came in and added my parts in with it. I Would Etc was one of my favorite bands so naturally they were a big influence on me. I really wanted to play keys parts that sounded like they had been there all along. Also, Led Zeppelin. Paul: I'll mostly defer to Stephen on this one. Any music from the genre that I knew then or now, I came across through playing in the band. Prior to that, I was primarily into bands like Hot Water Music, Braid, and Mock Orange. I still am, really. By the time we had really settled into the band, I had really taken to the groups we played with locally and on tour like Helen of Troy/Gospel, Blame Game, SIDS, Circle Takes the Square, and Fall on Deaf Years/Combine/Towers. ● Twelve: Song Twelve was this Spanish-influenced thing that I would bring to practice every week, but that we could never figure out how to use. We probably messed with it for six months—always getting stuck in the same place—before having a breakthrough. ● Six: The guitar part of Song Six was inspired by my roommate’s band, Camaro Crotch. It was the last song we wrote with Danny in the band. It probably would have made better sense on the first record. It still feels out of place, to me. ● Seven: The first time I heard Pinback’s “Loro,” I was listening to WRAS, the Georgia State University college radio station. I was driving to visit my friend Bryan, whose face is on the cover of the first record, and who played drums in Two Hand Touch for a little while. I wrote down the name of the band on a little scrap of paper because I knew Bryan would love the idea of using numbers in place of lyrics. When I showed up to Bryan’s work, the first thing out of his mouth was, “You have to hear this band called Pinback. They sing a song with numbers!” Funny coincidence. I saw Pinback play a show in 2001. Afterward, I asked Rob Crow about those numbers. We talked for what felt like twenty minutes. I’m afraid to paraphrase his explanation. It has been fifteen years, so I am sure I will get it wrong. What I can say with certainty is that those numbers took on a special meaning for me. The same way some people sometimes sign letters with “xoxo” or “143,” the numbers 49531 became a placeholder for “love” in my mind. Not cutesy love. Cosmic, universal love. The rest is a secret that I will take to my grave. Haha, even my wife got mad at me recently because I wouldn’t explain it to her. But what I will say is that the rest of the lyrics are a reference to a scene in Richard Linklater’s “Slacker”. Paul: From my perspective, we wanted to the album to sound like the best live show we could have possibly done. That song was always in our set. If we ever played any shows without it, there weren't many and I don't remember any of them. Another point about the songs history: we referred to as "Song 3" because it was the third song in our original set, even though it was actually the second song that we ever wrote. I still have the original cassette recording of it during one of our very first practices. There are little section we were never really able to recreate that I still think sound awesome. The point of all that is, it was always one of our favorite songs to play, and it was the only song from the original set that we kept playing until we split up. Between 2003 and 2006, we had grown so much as a band, it just felt right to take another crack at it and do it better. Stephen: As with most of the songs I wrote at that time, my lyrics were about my changing views on religion. The song is a not-so-thinly-veiled reflection about a friend who was—and still is—an incredible person, but who attributed all success to a Divine Plan. The last line (“It’s beautiful”) was a reference to the day I stopped believing in god—how I came to the conclusion that the absence of god did not detract from natural beauty or human generosity. If anything, it made those things more special. That was very comforting to me. On the first record, we used a passage from Kurt Vonnegut’s "Timequake" which captured that idea. At live shows, we occasionally had someone read the passage while we played. But on tour, we preferred to use the voicemails. They were left by a very close friend—also an amazing human being and devoutly religious. He left those messages the night he moved away. I didn’t hear them until the next day. Nothing terrible or heartbreaking happened to him, fortunately! But as we evolved, as the song evolved, those voicemails seemed like fitting context and/or texture. I was glad we had a chance to record that version of the song. Stephen: Song Nine was largely repurposed guitar parts from Something Personal Like Handwriting, a guitar/violin/piano side project that never got off the ground. ● So this is our Home. Stephen: “So this is our home” is one of those things that was not really planned, it just happened. Justin had the bass part. He and Lindsay had been writing lyrics together. They played it for me at Paul’s house while Paul and Tyler were recording their parts for the record. I tweaked the vocal arrangements so the male/female vocals were staggered and made some minor changes to the lyrics. The rest was them. I was really impressed with how it turned out. Stephen: We used to record each practice on a cassette tape and then listen to it the rest of the week, figuring out what needed to be fixed or how we could rearrange parts of unfinished songs. The Country Song was originally a long, repetitive jam session that I had on tape. I would sing along to it on my way to and from work. When we decided to put it down on tape, I realized that I am a terrible singer! After a few embarrassing takes we agreed that Tyler should sing it for the record. Tyler: When we were recording the vocals for Country Song I learned the value of alcohol when doing vocals. Stephen: I wish that I had prepared better. Listening to the record now, I realize that my guitar playing is really sloppy. I should have tracked my guitar parts in advance to figure out the best combo of left/right channels, clean/distortion/delay effects, and so on. Same for the vocal arrangements. The transitions between tracks also bothered me. We recorded the songs so that they could bleed together, much like our live set. As one song was fading out, the next song was supposed to fade in or start. Sadly, the person who mastered the record didn't get clear instructions, so there is an abrupt stop between each track. When I heard the mastered version, I felt like we had just run a marathon only to be tripped at the finish line. I’ve never been able to enjoy the record for that reason. The pressure of recording during final exams and to press the record before summer tour forced us to make some hasty decisions. Those are some of those things I still fantasize about being able to fix. Tyler: I’m listening to the record right now for the first time in a few years and I am really impressed with how well it has held up. My only issues I think I have ever had with it is the mastering - some dramatic level changes from track to track. Now that it's been ten years I have had a lot more experience with recording, I would mix the tracks a little differently. Overall though I still love it and I am proud to have been a part of it. Paul: I was never really comfortable with some of the additional percussion on the album (track 6, titled "#"). But I'm really glad we had Travis Thatcher (recompas, Judy Chicago, etc) play saxophone on Songs Three and Seven. I always wanted Travis to at least tour with the band, but he always had so much other music going on and there wasn't any more room in the van. There are also a few spots in the mixing and mastering I wish we could go back and fix the overall levels. Despite those few spots. I think the production is pretty satisfactory for what amounted to a very amateur/DIY recording. Erik Olson, my freshman year roommate at college had just bought some recording equipment to help out another Atlanta band that he had been playing with, Moorish Idols. "Believes In Patterns" was probably the second or third recording he ever did. I'm also really glad that I sold that god-awful china cymbal that I used way too much on the first album. Stephen: Haha! When we first started playing, I begged Paul to use more double-bass and china! I wanted us to be a shameless metalcore band. He still won’t let me live it down. I was also really happy with Travis’s saxophone parts. And simply pleased by the fact that we ever got these songs on tape. Thank you for this interview! It was a pleasure to get more details about the band and an album. I truly love it, and it's hard to get information on it from all around the web, browsing 2006-2007's forums.